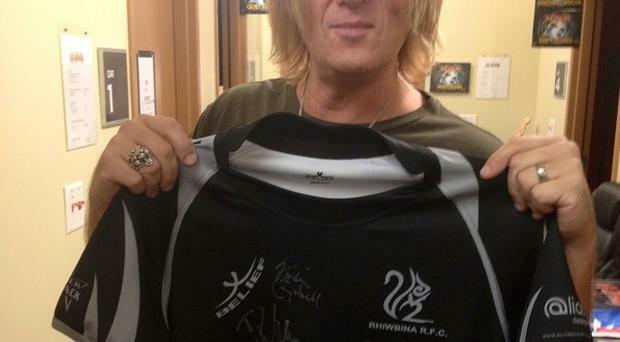 A children's rugby team can boast the loudest shirt in sport - after getting sponsored by rock legends Def Leppard. Rhiwbina under-10s in Cardiff teamed up with the multi-platinum rockers thanks to coach Richard Proctor. The 46-year-old is good friends with the Sheffield five-piece after designing the artwork for three of their albums. So when the young Welsh side were on the hunt for new sponsors Mr Proctor decided to drop his rock star pals an email asking if they fancied having their band's logo on Rhiwbina's shirts. Lead singer Joe Elliott said: "When he told me he needed a sponsor, I jumped at the chance, only afterwards did I realise it was a rugby and not a footy team! "Like all things with our logo on it, I think it looks spectacular. I'm not sure it's going to guarantee a winning team every week though, but at least they will look cool." As well as getting Def Leppard's logo on the jet-black shirts, he also designed the kit. Mr Proctor said: "It has to be one of the coolest sponsorship deals ever. "The boys are over the moon about it - they are few teams that can boast having a band like Def Leppard as their sponsor, let alone a children's rugby team. "A lot of the boys had already heard of Def Leppard through video games like Guitar Hero and Rock Band. And the ones which haven't have become converts now." Abba’s 1976 record Arrival is the band’s best-selling studio album in the UK to date.